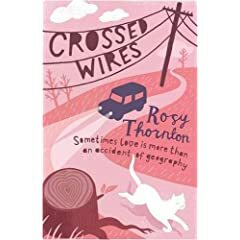 Crossed Wires by Rosy Thornton, 343 pages. I first heard about Rosy Thornton's books on goodreads. And had imagined they would be a good introduction into British chick lit...but the latest by Jill Mansell moved to the front of the line. So when Ms. Thornton contacted me and offered to send me her latest, I was eager to get another chance at the genre. While I don't know about the rest of her books, which I have on my TBR list, Crossed Wires is a mature version of chick lit. Let me explain, this is a good thing. The characters are not flaky or shallow - in this case single parents who meet when Peter has a minor accident, calls the insurance company and gets Mina. Their relationship develops over the phone through much of the story and the character development is richer than most of the fluff out there. You get to know the separate families, their struggles,and they seem like real people - not the desperate one dimensional characters found in most of the genre. So if you're looking for a solid light read - I recommend Thornton's books. She seems to understand that you can still have a sweet story without being superficial. If you'd like to win a copy of this book, leave a comment. I'll pick a winner at the end of the month. I would love to win a copy of her book. Great review and I've never heard of this author until your review.